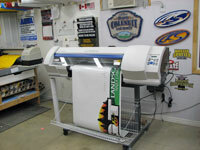 Gord Colenutt of Colenutt Signs has been creating quality signs since 1999. Centrally located near Essex, Ontario, Colenutt Signs provides service to all of Essex County including Windsor and surrounding communities, offering a variety of services, from logo design to specialty graphics. Whatever your sign needs, Colenutt Signs has the experience to meet or exceed your requirements. Gord will survey your location and discuss your needs. Let him know what you want and he'll take it from there. 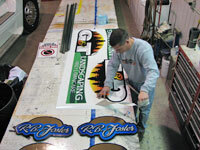 Gord builds all kinds of custom signs, delivers and install them if needed. You can count on a creative design, together with quality craftsmanship, for a sign you will be proud to display. From conception to completion, Colenutt Signs stands behind their work, delivering a quality product on time at a fair price. The ability to handle production in-house helps control costs and schedule work to meet your deadlines. Other materials used when creating their signs include overlaid plywood and corrugated plastic. Hand painting and lettering, and magnetic signs are also available. Air brushing is used on specialty items such as goalie helmets and motorcycles. 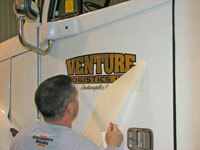 For large vehicles, installation is available at your facility or theirs. Letting everyone know about your business requires a quality sign. At Colenutt Signs, customer satisfaction is guaranteed. For ideas, design, and production of your everyday and specialty sign needs, be sure to make Colenutt Signs your first resource. Contact Gord today for your free signage consultation or to get a quote.